随机年份和平元VG银币 Buy this historic American Peace silver dollar at the best price online, we ship worldwide. Minted from 1921 to 1928, as well as 1934 and 1935 these coins are a great way to add some history to your portfolio. After WWI, a movement started to issue a coin to commemorate the peace, and that such a victory coin be "issued in such quantities it will never become rare". The winner of the competition to design the new coin was Anthony de Francisci, who used his wife Teresa as his model. The obverse features Lady Liberty with a crown meant to resemble that on the Statue of Liberty. The studio window was open when de Francisci worked, hence the blowing hair of Lady Liberty on the coin. 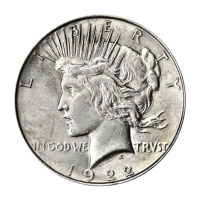 The Peace dollar was the last regular production dollar struck in silver. They were produced with ninety percent silver and ten percent copper in order to conform with the coinage act of 1837. These Peace dollars are average circulated coins, rated as very good. The design is clear and major elements are defined but are flat and lacking in detail. We have limited numbers of these available, order yours today.